We are a manufacturer of Self support extendable ladder with movable in Hyderabad, Telangana and supplying our products to all over India. These extension aluminum ladders are manufactured from hollow seamless extrusions having corners radiuses for strength. The crossbars are fitted well to synchronize with other heights of trestles and to keep performance plank level. The ends of aluminum extension ladders stiles fitted with rubber plugs and even some are available with rolling wheels & breaks. 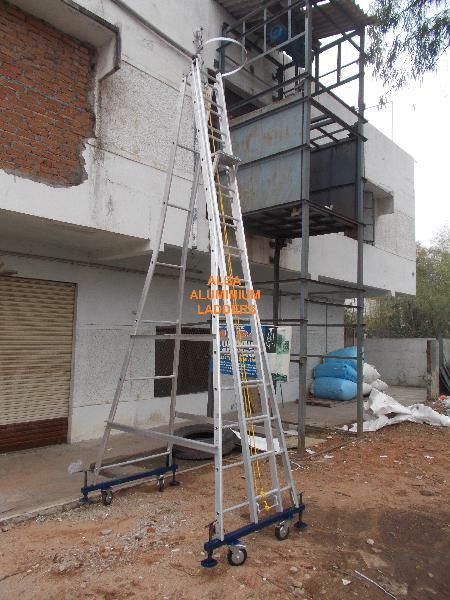 Further, they are also designed with extension facility.We manufacture and supply a wide range of all types of aluminium ladder with marketable prices.